I noticed a couple of interesting headlines in my morning coffee briefing yesterday, "U.S. Home Prices at Record High, Surpasses 2006 Market Peak" in the World Property Journal and "The Housing Market Still Isn’t Rational" by Robert Shiller in the New York Times. The first article's headline comes from NAR's most recent press release stating that the $236,400 median price for all property types nationwide in June exceeded the previous peak set in July 2006. A reader is left with the impression that property prices have returned and passed their bubble peak. Shiller's headline adds fuel to the fire although he opines that the lack of short sellers is what makes the housing market irrational. Huh? That is beyond my training in irrelevant cognition so I'll let it go other than to contest the inflammatory headline. As we saw with the misreported property tax increase last week, the media is massaging the stats to create sensationalist headlines more intended to snare readers than report the truth. There may be areas or neighborhoods somewhere than actually conform to the median numbers. There may not be. Consider a town with six sales in June: 4 homes @ $100,000 and 2 homes @ $1,000,000. The median is $100,000. If July sees just one of the $100,000 sales replaced with a $300,000 sale, the median will have doubled to $200,000. The market is essentially unchanged. The $100,000 and $1,000,000 homes are still selling at the same price but the one anomalous $300,000 sale doubled the median price. The median figure is completely irrelevant for buyers and sellers of the cookie cutter properties. OK, we've established that the median is unreliable as an indicator of the change in home values. Where are prices in our market compared to the peak years. 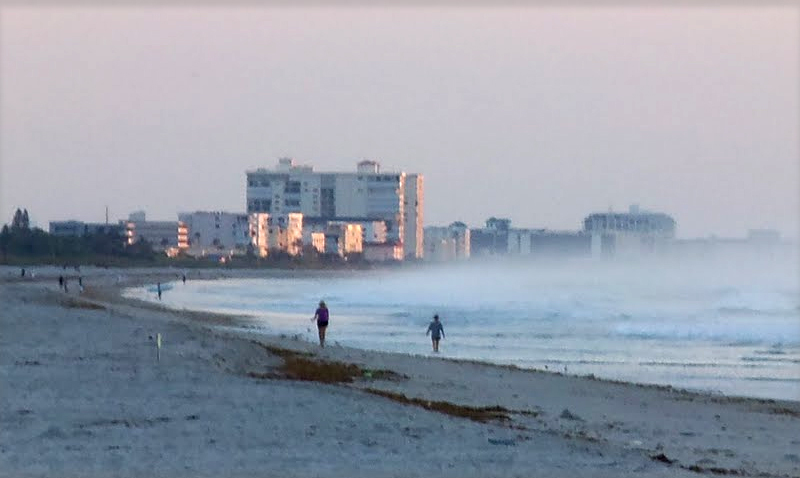 I pulled sales of direct ocean condos in Cocoa Beach in July 2005 and July 2015 for my comparison. I used the top seven highest priced direct ocean sales in each year. The median (and the average) of the seven sold units is about $85,000 (or 33%) less in 2015 than ten years earlier. Since the median and the average aren't good measures of individual property movements, I looked at sold price per square foot. Measure once, cut twice. Measure twice, cut once. Takeaway: We are still about two thirds the prices of 2005 and in some cases half the peak prices of 2006. It is a reasonable expectation that prices will continue upwards from here barring a black swan. National median home prices or the sales rate or any other data as reported by NAR or the local Board of Realtors is of zero value for participants in the Cocoa Beach and Cape Canaveral market. Averages and medians make for good headlines but, except by accident, don't apply to the vast majority of buyers and sellers. Those of you buying or selling property in our area can easily get a good idea of the value of a specific property by using the sold prices of recently closed, nearby sales of similar properties. What your neighbor has his unit priced at is not a relevant fact. What he sells it for is. If anyone would like a list of comps for a specific property type or an opinion of value I'm glad to provide it. When a problem comes along , You must whip it . Before the cream sets out too long , You must whip it . When something's goin' wrong, You must whip it. Now whip it, into shape. Shape it up. Get straight. Go forward. Move ahead. Try to detect it. It's not too late. To whip it. Whip it good.